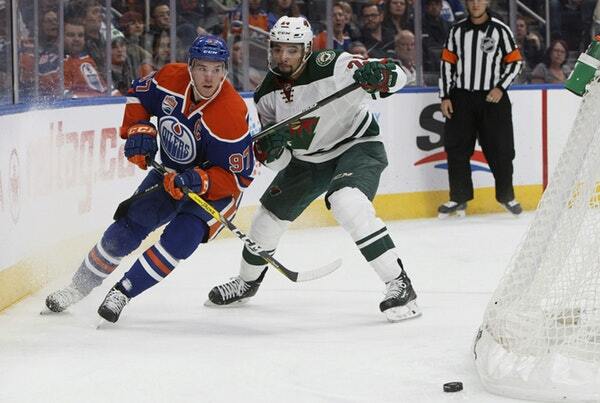 The Wild didn’t just trail the Oilers in the goals department Saturday. It was also overmatched in the special-teams duel, a snapshot of the game that helps explain why the Wild fell 4-1 at Rogers Place in the conclusion of a quick two-game road trip to Western Canada. “Special teams killed us today,” coach Bruce Boudreau said. Not only did the Oilers convert on both of their chances, but the Wild blanked on its three looks. Two of those chances came in the third period when the Wild was trying to catch up to the Oilers. Edmonton, meanwhile, used a power-play goal from captain Connor McDavid in the second period to go up 2-0 before center Leon Draisaitl added an insurance goal in the third period. It was the second straight game in which the power play finished empty-handed; as for the penalty kill, it’s allowed at least a goal in five of the last seven games. “We didn’t get it out, and that’s the failure with our penalty killing is when we’re getting it on our stick, we’re not getting it out,” Boudreau said. Here’s what else to watch for after the Wild’s loss to the Oilers. The defeat dropped the Wild to 4-7-1 in the second half of a back-to-back this season. This result also continued a trend of setbacks against teams below the Wild in the standings. Although the Wild was able to upend the Canucks and it got by the Hurricanes and Red Wings recently, the team’s last three losses are all against teams out of a playoff spot. At times Saturday, the Wild looked like a team completing a back-to-back after traveling to Edmonton from Vancouver. But that’s not an excuse for letdowns like the Wild had against the Oilers in Boudreau’s eyes.